Immune cells are sensitive to the microstructural and textural properties of materials. Tuning the structural features of synthetic bone grafts could be a valuable strategy to regulate the specific response of the immune system, which in turn modulates the activity of bone cells. The aim of this study was to analyse the effect of the structural characteristics of biomimetic calcium deficient hydroxyapatite (CDHA) on the innate immune response of macrophages and the subsequent impact on osteogenesis and osteoclastogenesis. Murine RAW 264.7¿cells were cultured, under standard and inflammatory conditions, on chemically identical CDHA substrates that varied in microstructure and porosity. The impact on osteogenesis was evaluated by incubating osteoblastic cells (SaOS-2) with RAW-CDHA conditioned extracts. The results showed that macrophages were sensitive to different textural and structural properties of CDHA. Under standard conditions, the impact of inflammatory cytokine production by RAW cells cultured on CDHA played a significant role in the degradation of substrates, suggesting the impact of resorptive behaviour of RAW cells on biomimetic surfaces. Osteoblast differentiation was stimulated by the conditioned media collected from RAW cells cultured on needle-like nanostructured CDHA. The results demonstrated that needle-like nanostructured CDHA was able to generate a favourable osteoimmune environment to regulate osteoblast differentiation and osteogenesis. Under inflammatory conditions, the incubation of RAW cells with less porous CDHA resulted in a decreased gene expression and release of pro-inflammatory cytokines. Sadowska, J., Wei, F., Guo, J., Guillem-Marti, J., Ginebra, M.P., Xiao, Y. 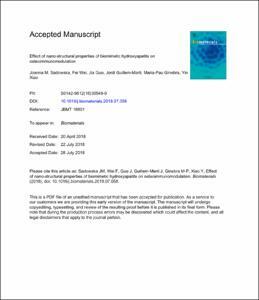 Effect of nano-structural properties of biomimetic hydroxyapatite on osteoimmunomodulation. "Biomaterials", Octubre 2018, vol. 181, p. 318-332.